Published in Winter 2012/2013 Grassroots Mapping Forum #3. Order online. 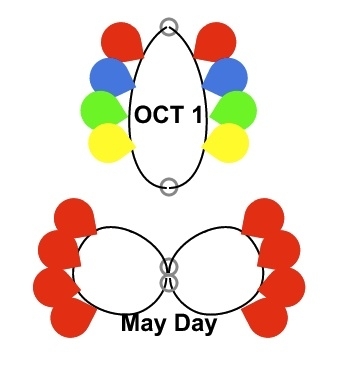 On May Day, May 1st 2012, Oscar Brett and Zach Heber organized and documented the third and latest party balloon video rig. 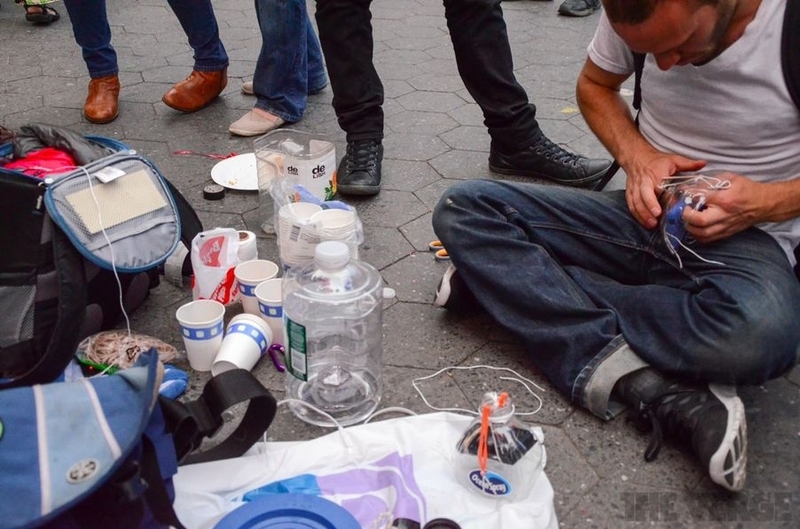 Originally inspired by Fundación Ciudano Inteligente’s pioneering work with live streaming from party balloons in Santiago in 2011, Oscar and Zach refined their technique during Occupy Wall St. This balloon flight involved 75+ people in tying and launching 100 balloons, using involvement to build support, consent, accountability, and excitement around a live video feed. The rig flew on three tethers held by three people, for control and stability. The camera was on one line dangling from the balloons, and rotation became an issue, but the feed was still useful. Attaching the camera to multiple tethers might have enhanced stability. 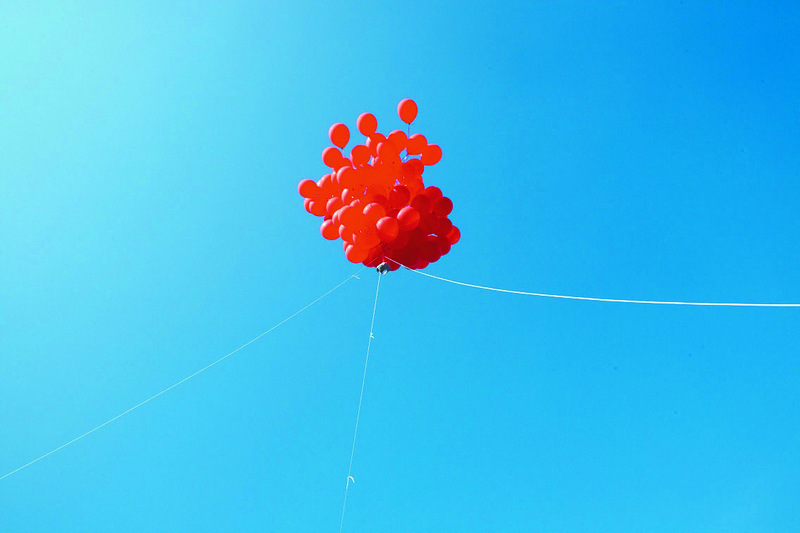 After the creation of the appropriately sized [camera housings] and the testing of the livestream [from the phones] we received a delivery of (100) 12’in red party balloons and had ten 10ft cords of [nylon] rope cut and attached to one central key ring. 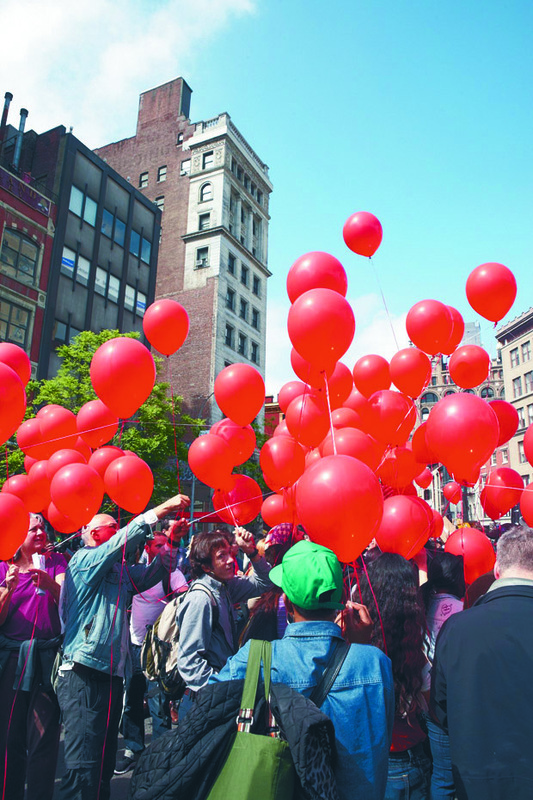 People, curious of the mass of red balloons, had by this time began to gather. We began the process of outreach. We started by handing off the central ring, which all cords were attached; this volunteer stood centrally in the “skillshare” zone as ten additional volunteers were handed strings and asked to fan out, into a circle around him. From here the “people mic” was used to communicate with the large crowd of volunteers. People were quickly explained the technique of tying ten slip knots to each of the 10 cords. This process, which i anticipated would take a decent amount of time, occurred almost instantaneously. This process also encouraged community building among diverse groups of activists. Conversations began as some volunteers taught others how tie slip knots and even more volunteers explained time and time again to passersby what was going on. 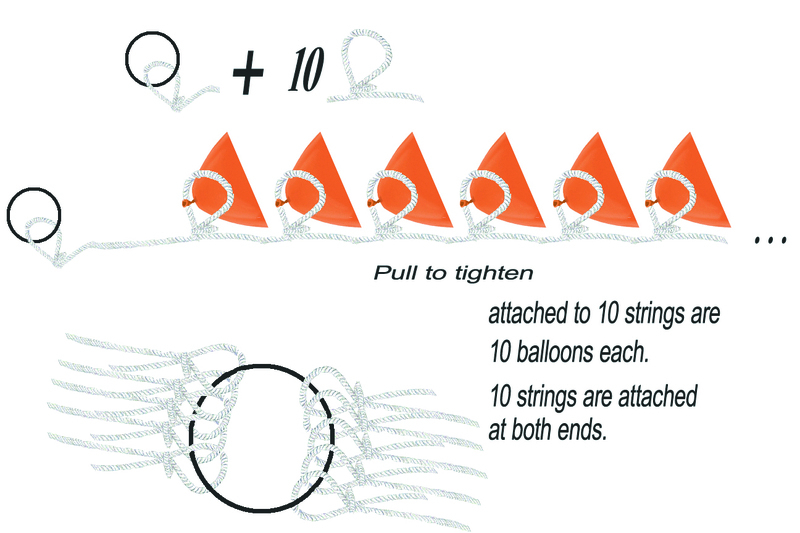 The following step was to attach the 100 balloons to the 100 slipknots. The eleven volunteers managing the key ring, cord, slip knot apparatus stayed put while the mass of protesters, strikers, and activists cued up and were given balloons by Zach Postone and Yaeir Heber. Each volunteer fastidiously attached one balloon to one slip knot; the rig now began to take on the qualities of a ten legged red octopus with 100 little red ribbons dancing underneath it. This next step was my favorite; Zach, myself, and two volunteers began to talk about the idea of leaving on or cutting off the dangling red ribbons. Arguments were made that the strings should go, because they might obstruct the camera, and that they should stay, because it added to the striking visuals of the satellite [balloon rig] itself. In the end we decided that we could not make this call on our own, we put the decision up to a general consensus. Using the “peoples mic” we posited the issue to the crowd (cut the string or keep them) and allowed for a general consensus vote of confidence in order to decide our course of action– the people spoke and we cut the red ribbons off. The process of flying the rig was executed by Zach Postone, Yaeir Heber, and myself. The initial goal was to fly and capture a live stream of the rally. Because of the high density of people and presence of trees, awnings, light poles, and A/V equipment used by the concert organizers we decided to fly using the triangulated of three tethered method pioneered during the Oct 1st flight, which offers more control. This methods requires three lines to be attached to the rig and for the three pilots to stand in a triangle formation on the ground.